Lake Tahoe is fabulously beautiful from almost any perspective. There are certain places around the lake, however, whose beauty is so striking, so stunning, that one begins to believe they must have been copied from a starving artist’s painting or some inspirational poster. 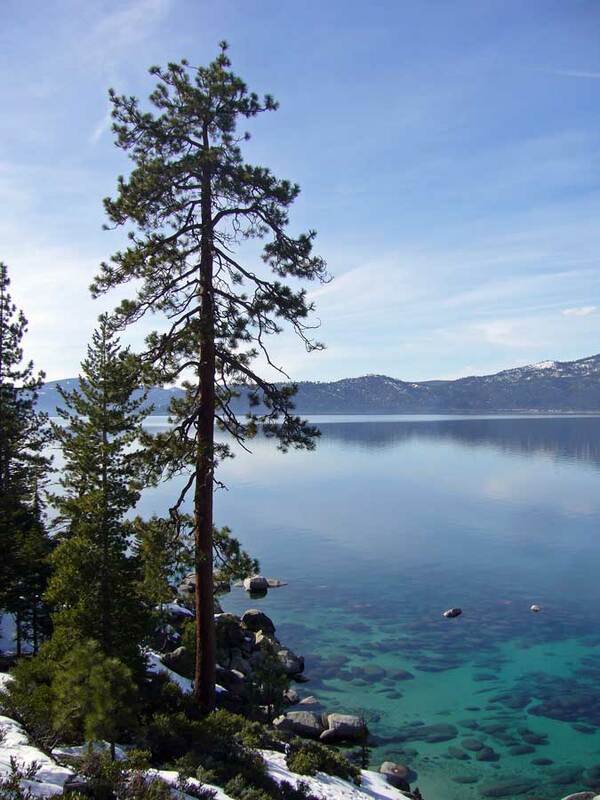 I have already highlighted one of these places – Emerald Bay, sitting at the lake’s southeastern corner on the California side. 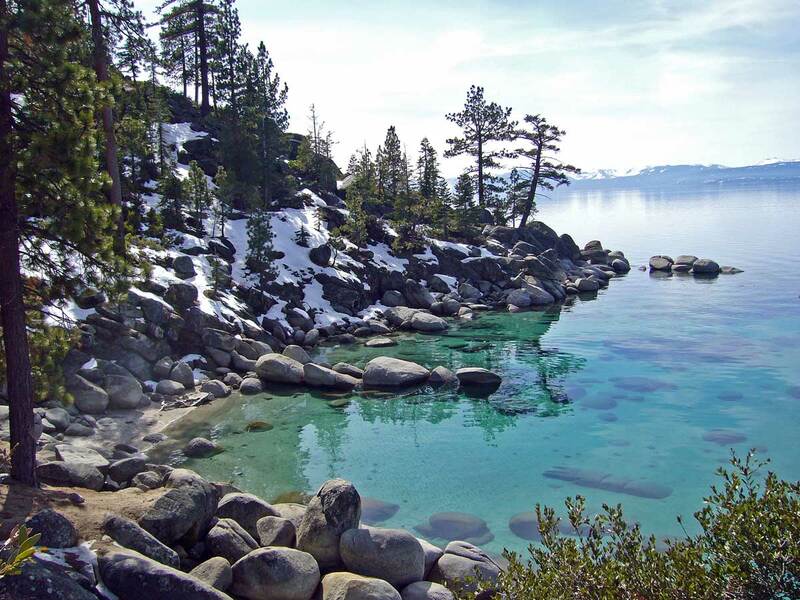 Emerald Bay is, in fact, the most dramatic example of the beauty that characterizes Lake Tahoe’s entire western shore – a boulder-strewn landscape sprouting rich forests of white fir, pine, and incense-cedar, massively trunked and often draped with lime-green mosses and lichens. Nevada’s eastern shore, in contrast, has a different feel – its forests more open and dominated by Jeffrey pine due to the relatively lower amounts of rain and snow that reach the eastern shore. I do not mean to imply, however, that the eastern shore is any less beautiful than the western shore – far from it, and after a day of cross-country skiing at Spooner Lake (just below Spooner Summit, elevation 7,200′), my family and I discovered an eastern shore jewel with as much raw, overwhelming beauty as any of Lake Tahoe’s other premier scenic vantage points – Sand Harbor Overlook. While the views from Sand Harbor Overlook may not match the grandeur of Emerald Bay, they certainly equal (and perhaps surpass) its more famous landmark in their intimacy and varied perspectives. 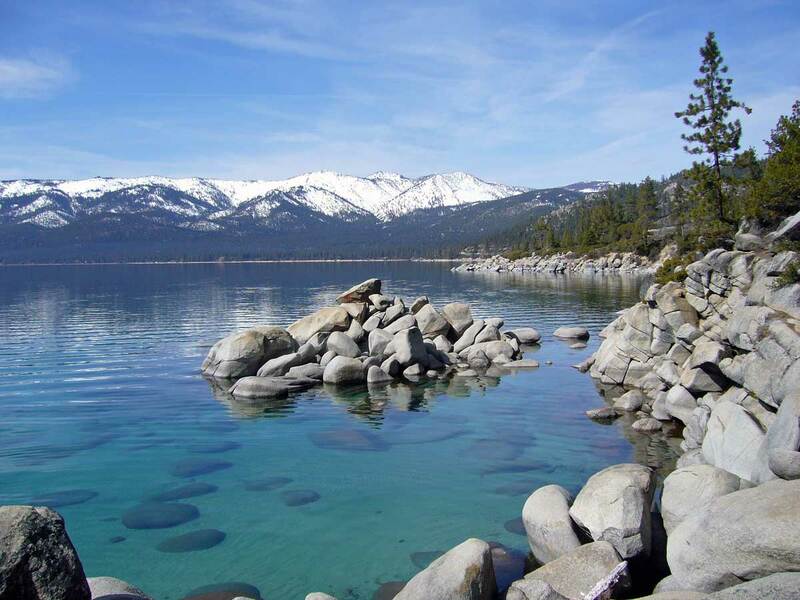 Whether viewed from high atop the granite point that jutts out into shallow, sandy-bottomed bay, or from lake level atop one of the half-submerged granite boulders, no other vista around the lake shows off Lake Tahoe’s famously clear waters better than Sand Harbor Overlook. Moreover, unlike most of scenic points around the lake, views of the vantage point itself are as dramatic as the views from it. I suspect that during the summer months, Sand Harbor Overlook is trampled daily by an unending stream of sightseers, many of whom quickly jump out of their cars and briskly search for a spot or two from which they can take photographs before jumping back into their cars and rushing off to the next scenic spot. Such “power” sightseers rarely experience the full beauty offered by Sand Harbor Overlook – their photographs cluttered by strangers in bright clothes, and their memories of what they saw limited to an instant in time. Similar to our experience at Pyramid Creek Geological Area, we had the good fortune to experience the beauty of Sand Harbor Overlook in complete solitude – able to slowly imbibe the subtlties of scale and nuances of each vantage as we explored the area with leisure and reverence. Unmolested by strangers, our contemplations were free to meander slowly, unintruded by persistent background chatter and adolescent shouting. While I came to Lake Tahoe this winter to enjoy the skiing, I walk away with renewed awe at its extraordinary, unending beauty. This entry was posted in Pinaceae and tagged Botany, California, geology, Hiking, Lake Tahoe, landscapes, nature, Nevada, science, trees. Bookmark the permalink. Look at how clear that water is. That would be a great place to swim and fish. How beautiful the mountains are in the distance. Thanks. There are some sand beaches just to the north of this spot that are popular during the summer – although a maximum surface water temperature of 68° would make for some very brisk swimming! Enjoyed your post. I have lived at Lake Tahoe for 14 years, and every single day the beauty takes my breath away! At first glance, we thought we were seeing the Caribbean — the water had a similar green crystalline beauty. And then the conifers and snow and distant mountains came into view. What an amazing experience to be there in solitude, wandering amongst the stones and trees. You’ve added a new ‘dream-adventure’ to our list — to someday sit on that shore and just watch the water for hours. Thanks, Ted! Thanks, Kenton and Rebecca. I had exactly the same thought when I saw the water. I’m actually glad I got to experience this site during winter – solitude at such an overwhelmingly beautiful spot is so rare, and the snow provided such a wonderful contrast to the tropical looking waters.